First though, a word about LED lighting. An LED – or light emitting diode – is a device in which an electrical current is passed through a semiconductor material – or diode – in order to generate light. Unlike conventional lighting technologies, which make use of the process called incandescence (heating a filament until it glows, basically), LEDs rely on the phenomenon of electroluminescence (converting electrical energy into the light). You see, when the current is passed through the LED, electrons are knocked loose from the surface of the semiconductor material, and in the process, they emit quanta of electromagnetic energy known as ‘photons’ – which appear to us as light! Visible light is really just electromagnetic radiation of a certain frequency and wavelength. LEDs do their job very well. Compared to older forms of lighting technology, like incandescent and fluorescent bulbs, they are many times more efficient, long-lasting, and deliver a better light quality, free of glare, flickering, humming and so on. They also generate next to no heat output. You can now find LEDs in many lighting applications – including in your home, your car, even in the screens of your smartphones, tablets and other electronic devices. Due to their superior efficiency and low carbon footprint, LEDs are also frequently touted as one of the major solutions to our current crop of environmental and energy crises. One more field where LEDs are making their presence felt is in flexible fabric lighting. Fabrics composed of natural or artificial fibres, combined with techniques like sewing, have long served our needs for shelter and protection from the elements. Less obviously, but no less true, fabrics have long contributed to our requirement for artificial lighting: not only do they make up the materials that get lit up by the fuel source to generate light – whether it’s the wick of a candle or the carbon filament inside a modern light bulb. They also – in the form of curtains, shades, drapes etc – help to shape, direct and model the light produced. Light and fabric are inseparably intertwined. It seems the logical next step, then, is to actually combine them in the one single, luminous fabric. And for some years now this has actually been going on. 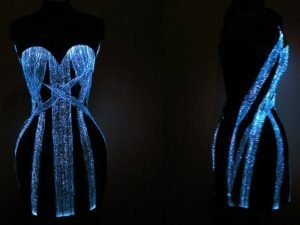 The first attempt involved the use of optical fibers, mechanically treated and combined with fabrics to create a homogenous, lighting textile. Of course, the light still had to come from an external light source – and due to the costs involved, this technology never took off at an industrial scale. 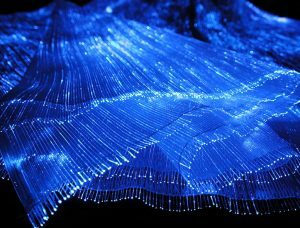 But with the development of LEDs, came the possibility of bringing the light source straight to the surface of the textile – and manufacturing flexible lighting fabrics on a far larger scale than ever previously imagined. The idea and concept of spreading LED lights across a textile were actually already patented by 1996. Even though the technology required to put the patented idea into practice was not available at the time, much of the groundwork had already been laid long before that – in fact, the winding of super-thin but very conductive tinsel foil or wire around a textile thread for decorative purposes was a technique that already used successfully in palaces and churches over many centuries. More recently, this technology had evolved to be capable of building telephone and headphone cables. In addition, the need for special clothing to help humans survive in extreme weather conditions like space, underwater and in the Arctic, had already seen the development of ‘wearable circuitry’, first in the form of heating underwear and later on sensor suits that monitored the vital bodily signs of astronauts, military personnel, athletes, and divers. Although tinsel wire was used in the initial stages of these and similar projects, it was found to be not very effective due to the problem of deposition of physical vapor, which reduced the foil’s conductivity. The next stage was the coating of special conductive fibers with copper or silver; the first mass application of this technology was the heating of seats in automobiles. Due to the advantages of an unbreakable conductive thread, capable of adapting its form and shape to any surface, further applications soon ensued – including electromagnetic and electrostatic shielding, healthcare, and finally wearable textiles. The first method for embedding low wattage LED’s on textile surfaces using conductive fibers was developed in 2013 in Germany. The other major form of flexible circuitry – the stretchable circuit board (SCB) which used a long copper conductor to connect individual LEDs sealed in polyurethane plastic – was developed in 2009, also in Germany. Today, there is a wide variety of lighting products available on the market that claims to use these flexible technologies, whether it be transparent, bendable sheets and panels, waterproof LED stripes and so on. All of them are limited in the extent to which they can adapt to various surfaces though, because the copper conductors can only be bent a certain number of times, and only at certain angles. For the most part, this is not really a problem, since fixed lamps and lights serve most of our lighting requirements very well. But in certain situations, a bit more flexibility is required. Let’s look at some of those. As energy costs, and awareness of environmental issues, has increased, LED lighting solutions have also found their way into the media and entertainment industries. But what about flexible LED fabric lighting? One particular feature of this industry that makes flexible LED lighting so attractive, is the need for fast and efficient solutions for assembling and disassembling lighting equipment on your typical movie or TV set. Traditional studio curtains and reflecting materials tend to be bulky and inflexible, requiring a lot of time to set up – and a lot of space to store. As a result, lighting technicians in this industry are now focused on replacing traditional lighting set-ups with a single, form free, ‘shining cloth’ that can be handled just the same as any other type of fabric. How does it work? Minute PCBs are embedded in a textile circuitry board, that is connected by conductive threads and embroidered into a fabric material. Super efficient LEDs make it possible to project any pattern of light onto this piece of cloth, ranging from high outputs capable of being used as a floodlight, to low-level ambient lighting applications. The main fabric materials to be used are the same lightweight polyamide materials that are used in parachutes, sails and hot air balloons. Not only are they lightweight, they are also tearing resistant, water-proof, flame retardant and heat resistant. The rip-stop weave pattern used in this material also ensures maximal stability for the circuitry inside. Even when the fabric is punctured or torn, the conductive fibers woven into its surface will not be disrupted. For protection, a layer of Kevlar seals the ends of the copper wires reaching out into the ‘hard’ world. This is the only part of the light that is still limited by the rigidity of the connectors mentioned above. The fibers that create the lighting effect are mechanically treated to create a helix shape, then woven into the fabric to create a three-dimensional optical effect. Beneath the top layer, a spacer fabric diffuses and enlarges the light emitting area and protect the LEDs from mechanical impacts. The whole unit is powered by an external AC-DC power supply. The light ‘s color temperature and intensity can be controlled either manually or via DMX remote control. Whilst currently limited to the media and entertainment industry, the possibilities of flexible LED fabric lighting are much broader. Superbly versatile, different LED pitches, combinations, and variations in fabrics are all possible. Within a few years, we could see the development of LED lights built into tents, canopies and other outdoor equipment, that needs to be lightweight and easy to transport. Other possible uses include at fairs, exhibitions, presentations – any setting requiring a non-permanent, easy to set up lighting installation. do you sell by the yard and how many lumens can a sheet of fabric go up to? Sadly no, we do not sell the LED fabric. Previous story Can solar panels generate too much electricity?